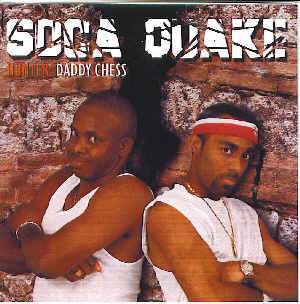 SOCA QUAKE by HUNTER & DADDY CHESS,two former Dominica Calypso Monarchs,(Hunter-1998&2000),(Daddy Chess-2001) is an explosion of Soca music with some strong Calypso rhythms that indicate that these two Calypso or Soca giants are still full of energy. "Tsunami" is a clear Soca winner as both artistes collaborate with endless vigor. Hunter entertains well with "Tiger Woods" and "Amazing Grace" while Chess keeps you in the party mood with "Party Time" and "Don't Stop the Music".